INTRODUCTION. Calligraphy has a long and distinguished history in China, and this enthusiasm has extended to those nations who imported China’s writing system. Japan adopted Chinese ideograms most vigorously after the introduction of Buddhism to Japan in the mid-6th century, but the art of calligraphy was not pursued in Japan until the early years of the Heian era (+794-1185), when Japan’s so-called Three Great Brushes (Sanpitsu 三筆) began practicing calligraphy as an art. 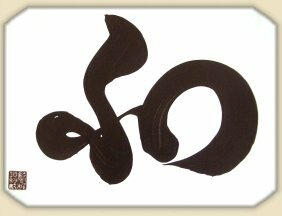 Nonetheless, the great watershed in Japanese calligraphy (in my mind) did not occur until the widespread propagation of Zen Buddhism (Chinese in origin) early in the Kamakura Era (+1185-1333). The contribution of Zen to Japanese culture is profound, and much of what the West admires in Japanese art today can be traced to Zen influences on Japanese architecture, poetry, ceramics, painting, calligraphy, gardening, the tea ceremony, flower arrangement, & other crafts. In calligraphy, the brush line that is sweeping and fluid -- spontaneous rather than predictable, irregular rather than regular -- is highly treasured. To paraphrase Alan Watts, much of Zen art is the “art of artlessness, the art of controlled accident.” Below I present some of my favorite brush work, almost all by contemporary artists. 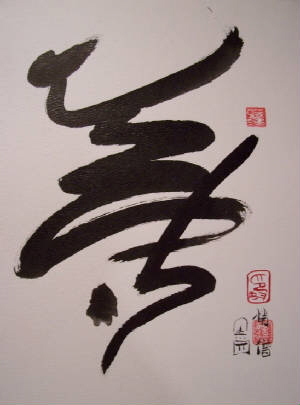 This is followed by a brief history of calligraphy in China and Japan. Tenjin shrines, especially those devoted to Sugawara no Michizane 菅原道真 (+845 - 903 AD), are closely associated with calligraphy. Michizane (a courtier in the Heian period) was deified after death, for his demise was followed shortly by a plague in Kyoto, said to be his revenge for being exiled. Michizane is the Japanese patron deity of scholarship, learning, and calligraphy. Every year on the 2nd of January, students go to his shrines to ask for help in the tough school entrance exams or to offer their first calligraphy of the year. Egara Tenjin (in Kamakura) is one of the three most revered Tenjin Shrines in Japan, and among the three largest. The other two are Dazaifu Tenmangu (near Fukuoka; Dazaifu is where Michizane was exiled), and Kitano Tenjin in Kyoto (Michizane's birthplace). Click here for more on Japanese shrines. Monju Bosatsu 文殊菩薩. (Sanskrit = Manjushri or Manjusri). The Guardian of Buddhist Law, the Voice of the Law, the Wisest of the Bodhisattva. In Japan, students pay homage to Monju in the hopes of passing school examinations and becoming gifted calligraphers. Japan's popular Fire Festivals, held around January 15 each year, are also closely associated with calligraphy. Shrine decorations, talismans, and other shrine ornaments used during the local New Year Holidays are gathered together and burned in bonfires. They are typically pilled onto bamboo, tree branches, and straw, and set on fire to wish for good health and a rich harvest in the coming year. At these events, children throw their calligraphy into the bonfires -- and if it flies high into the sky, it means they will become good at calligraphy. 1986. Brushed by young Buddhist monk at Renge-ou-in (Rengeō-in) 蓮華王院, more popularly known as Sanjusangendo (Sanjūsangendō) 三十三間堂, one of the most impressive of all Buddhist temples in Kyoto. The temple houses the Kannon of 1000 hands and is said to contain 33,333 of her images. The fluid sweeping brush strokes invoke a sense of vitality and spontaneity. When watching him brush this character, it seemed as though his hand and arm were dancing rather than writing. 1986. Brushed by same young Buddhist monk as first image above. Again note the uninterrupted sense of motion and fluidity of brush. Despite the negative connotations of this term in English, the term in Japan and China has glorious overtones, for it represents the principle of “going back to one’s nature,” of forgetting the forms of the material world, of finding enlightenment by discarding the mundane world and all its concepts. Be nothing, and become everything ! 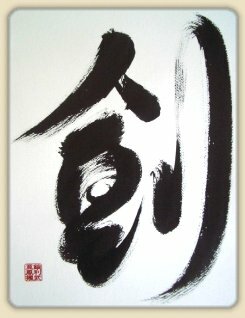 The large character is the word for “kokoro 心,” translated as heart, soul, spirit, or mind. This 17th century Japanese brush and ink handwriting, with its relaxed Zen spontaneity, is one of the exercises practiced by Zen monks today. Photo courtesy of: www.buddhanet.net. One widely known member of China’s Elegant Gathering was So Tōba 蘇東坡 (1036-1101), aka So Shoku 蘇軾. His Chinese name was Su Dongpo 蘇東坡. For details on this Chinese artist, see JAANUS. Orchard Pavilion Preface (Lanting xu) in cursive script (Ch = caoshu). Handscroll, ink on paper. 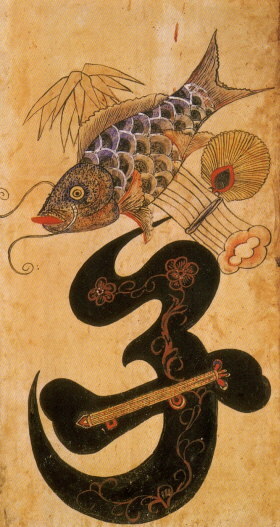 Dated +1629, by Gui Changshi (+1574–1645). China, another source +1573–1644, Ming Dynasty (+1368–1644). “Duojing Lou” calligraphy in semi-cursive script. Signed Mi Fu (+1051–1107). Album of twelve leaves. Couplet with commentary in seal and semi-cursive scripts. Dated 1883, by Zhao Zhiqian (+1829–1884). 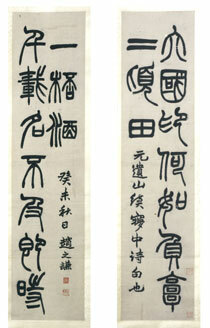 Pair of hanging scrolls, ink on paper. Kaisho 楷書. Formal square script, or block style. This style is used in modern newspapers, magazines, books, and most publications. It is the same script used at this web site. Gyosho 行書 (Gyōsho). Semi-cursive style; not as stiff as Kaisho nor as fluid as Sosho, and used for special effects in modern-day publications. Sosho 草書 (Sōsho). Cursive script. Also called Grass script. Flowing style, with slender lines, and composed with rapid fluid strokes. This is the type most often used in formal Japanese calligraphy. There are many others, like the Seal Script (Jp = Tensho 篆書) used for Japanese chops (name stamps), the Edo Script used in advertisements, etc. Most personal computers in Japan are installed with dozens and dozens of font sets. Kukai 空海 (Kūkai; +774-835), also known as Kobo Daishi 弘法大師 (Kōbō Daishi), is one of Japan’s most beloved historical figures. He is also one of the Three Brushes (Jp = Sanpitsu 三筆 or Three Great Calligraphers) of Japan. He studied China’s main scripts while visiting China in the early 9th century, as well as the Sanskrit Siddam script. On his return from China, he founded Japan’s Shingon 真言 sect of Esoteric Buddhism 密教 (Mikkyo (Mikkyō). He played an active role in many fields, performing rituals for the emperor, constructing a large reservoir in Shikoku for the common people, and establishing the first school for common citizens. His legend is riddled with folklore. He is credited with everything from inventing Japan’s kana script to introducing homosexuality. He is one of Japan’s most celebrated calligraphers, and supposedly published Japan’s first dictionary. He became a major patron of the arts, and reportedly founded hundreds of temples across Japan. The Shikoku Pilgrimage to 88 Sites is a popular pilgrimage attributed to Kukai. Sanskrit seed syllables are easy to spot in Japan. They are found on Japanese Buddhist amulets, gravestones, religious statuary, mandala artwork, and other objects, both old and new. By tradition, the introduction of seed syllables to Japan is credited to Kukai, who studied the main Chinese calligraphic scripts and Sanskrit Siddam while visiting China in the early 9th century, and brought back copies of the Seed-Syllable Mandala (see prior paragraph). Today he remains one of Japan’s most acclaimed calligraphers. Over time, Kukai's Sanskrit syllabary was modified to better fit the Japanese lexicon. Since the time of Jogon (Jōgon) 浄厳 (+1639-1702), the Japanese-Sanskrit syllabary has traditionally consisted of 50 phonetic sounds (五十字門). A chart of the 50 is shown below. Also read Sona, Souna. A signature in cursive script. During the Nara period, signatures were written in formal square Kaisho 楷書 script. The style changed to semicursive or Gyousho 行書 script during the Heian period, and later to cursive script, sousho 草書, where two characters were combined into one to form a symbol. During the Fujiwara period, this form of signature appeared in the opening paragraphs of letters. Considered to be similar to and perhaps an early form of a Kaou 花押. Ch: jianbi. Often Genpitsubyou 減筆描. Also Ryakuhitsu 略筆. Lit. abbreviated brush drawing. An ink painting technique that employs a minimum of brush strokes to capture the essential features of an object, human figure, or scene. Of the three categories of brushwork (shin gyou sou 真行草) it is closest to the cursive style (sou) well suited for symbolic, suggestive renderings. Genpitsu is thought to have originated in China during the late Tang dynasty (+618-907) and flourished during the Song dynasty (+960-1279). Liang Kai 梁楷 (Jp: Ryou Kai late +12-13c) is said to have perfected this technique, and many of his figure paintings are prime examples. One such painting is his "Li Po reciting" (Ri Haku ginkou-zu 李白吟行図), a hanging scroll in Tokyo National Museum. Chinese genpitsu paintings were greatly admired and imitated by Japanese painters, especially during the Muromachi period. The technique is one of the eighteen types of figure portrayal, jinbutsu juuhachibyou 人物十八描. Lit. 'reed-hand script'. 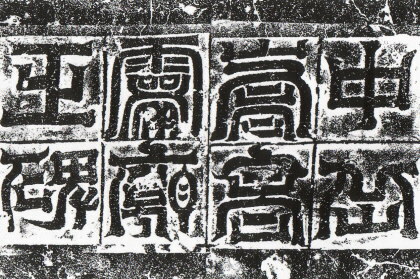 A decorative, pictorialized style of calligraphy, de 手, developed during the 9c in which cursive characters are disguised in the shape of reeds, ashi 葦, streams, rocks, flowers, birds, etc. A marsh scene with ashide characters was a motif frequently used in the under-drawings, shita-e 下絵, to decorate the paper of poetry anthologies and Buddhist scriptures or as the designs on textile and lacquer-ware. The term appears in literature from the 9th c onward. 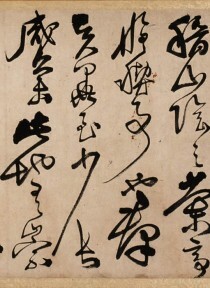 In the late 10c, The Tale of The Hollow Tree (UTSUBO MONOGATARI 宇津保物語), ashide is defined as one of several recognized forms of calligraphic script. Several extant examples of ashide date from the 12c. The decoration in underdrawing of 1160 in The Collection of Chinese and Japanese Poems for Singing (WAKAN ROUEISHUU 和漢朗詠集, Ministry of Cultural Affairs), with calligraphy written by Fujiwara no Koreyuki 藤原伊行, shows the fully developed stage of ashide. After the 13c, the term came to be applied loosely to mean: 1) a picture in which ashide characters were included; or 2) a type of pictorial puzzle or rebus using ashide letters and pictorial elements as clues to a poem (see uta-e 歌絵). These representations are also called reed-hand-script paintings, ashide-e 葦手絵, and they were no longer limited to marsh landscapes. For example, decorative cursive characters are found in a tree in the late 13c illustrated handscroll of The Lord Takafusa's Love Songs (Takafusakyou tsuyakotoba emaki 隆房卿艶詞絵巻, National Museum of Japanese History, Chiba prefecture). A picture with the Japanese syllabary cleverly used as part of the motif. Another type of moji-e was called ashide-e, where entwined grass, flowers or water motifs took the form of Japanese syllables. These were popular during the Heian period. In the Edo period, it became popular to cleverly arrange letters in the folds and outlines of the garments worn by samurai or beautiful women in the prints. This device can be seen in ukiyo-e by Torii Kiyomasu (fl.c. +1696-1716), paintings by Okumura Masanobu (+1686-1764) and picture calendars (e-goyomi) by Kiyomasu II, Nidai Kiyomasu (+1706-63). Single-sheet multi-color moji-e also survive by Isoda Koryuusai (fl.mid +1760s-80s), Katsukawa Shunshou (+1726-92) and Katsushika Hokusai (+1760-1849). the peculiarly unforced energy associated with breath. 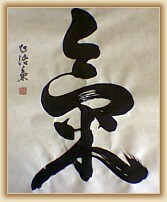 Calligraphy by Qiao Seng, a Zen artist. His artwork can be purchased by visiting his site. Beyond Calligraphy. 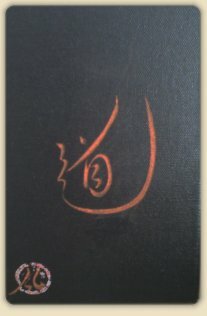 How to understand Far Eastern Calligraphy? This is a marvelous site with a wealth of information. Highly recommended. Online store selling Japanese stamps and seals. Translates your name into Japanese, and then creates the chop. Tao: The Watercourse Way. By Alan Watts and Al Chung-liang Huang. 134 pages, English. ISBN 0-394-73311-8. A classic on Tao. English text supplemented with wonderful Chinese calligraphy. Photo tour (139 pics) of calligraphy and other hand-drawn art from the annual Latern Festival at Tsurugaoka Hachimangu Shrine in Kamakura.